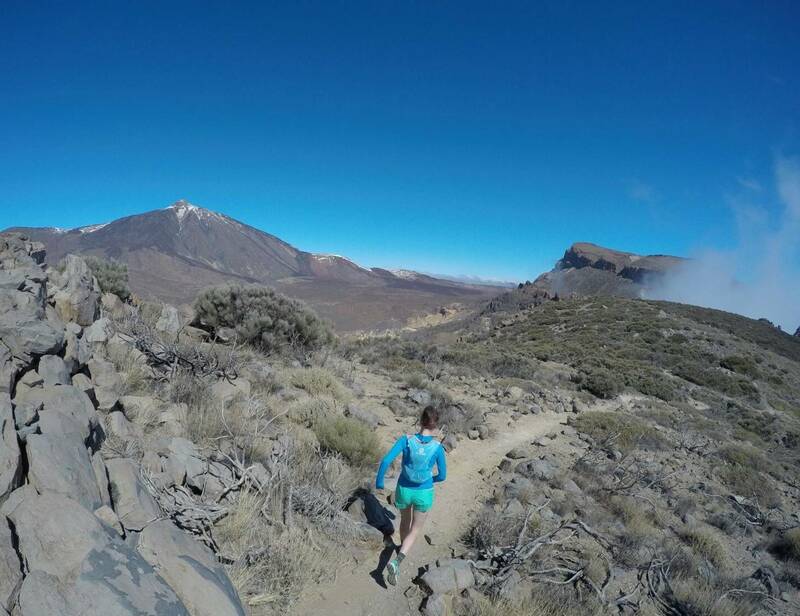 As well as a surprise proposal and our extremely exciting news, our third day of trail running on Tenerife was joyous! The weather in Vilaflor that morning was misty and cold, but thankfully deceiving as once we were up higher above the clouds the blue skies beamed and the sun crept through! 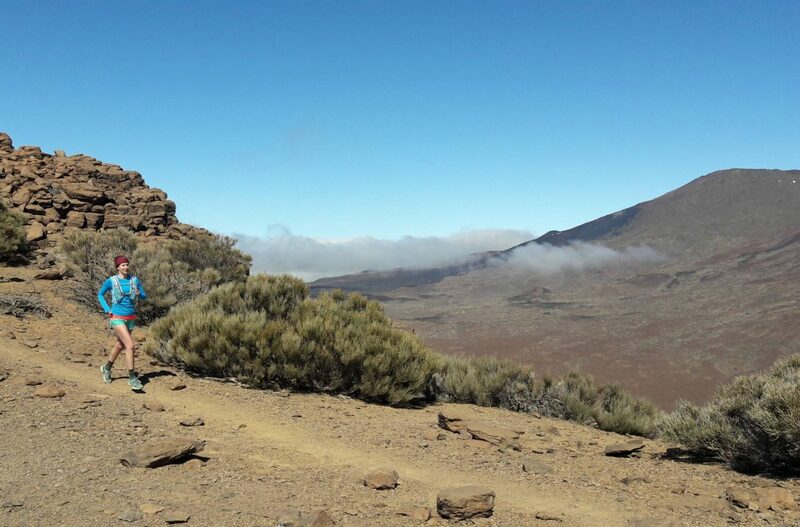 We took a bus, full of tourists heading to the cable car for Mount Teide, to Las Lajas and jumped off on the side of the road before finding a small trail towards Sombrero de Chasna – meaning the Chasna hat. We hiked our way through dense forest, still wearing our waterproof jackets, before the rough trails opened up and we stripped off, stuffing our layers into our bags and upping the pace on the dry, sandy paths. 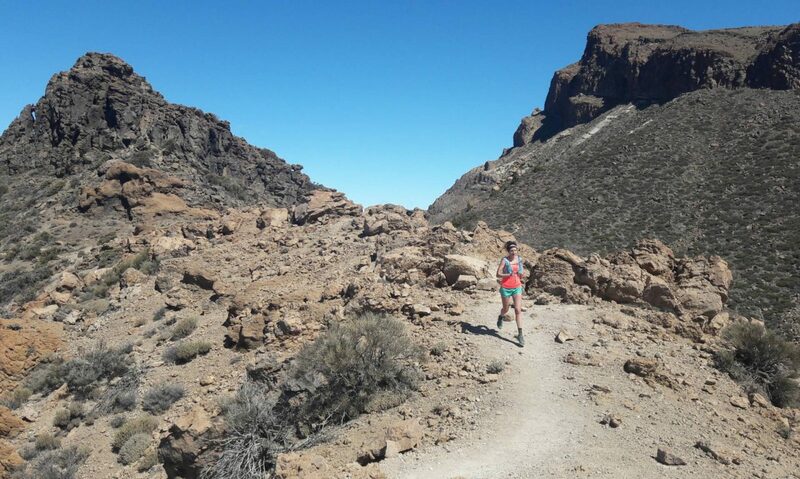 The trail skirts around the flat topped circular mountain of Sombrero de Chasna, or you can choose to take a detour and climb to its summit, where the path rises like a hat from the slopes of La Caldera in Teide National Park. 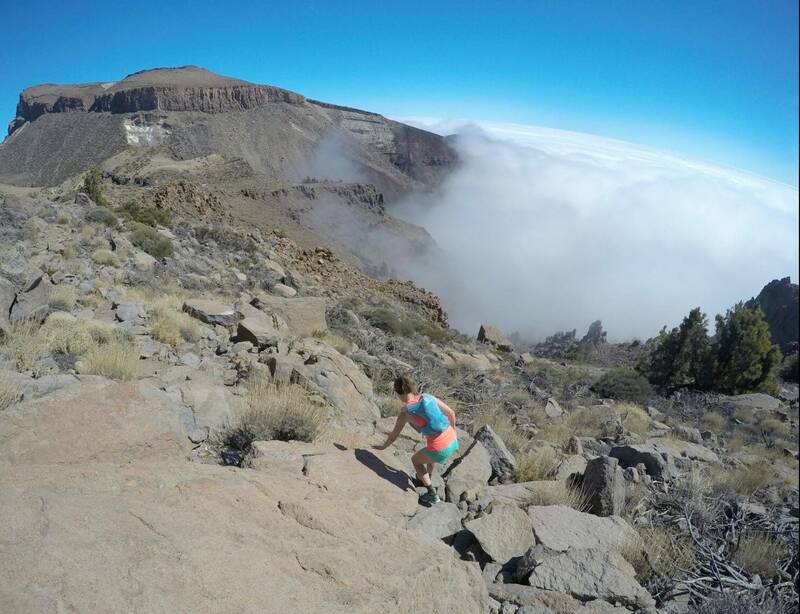 If you stick to the main path as we did the trail becomes slightly more rocky and technical, weaving up and down around big boulders, until you reach the ridge that overlooks the vast caldera below, eye-wateringly high and a long way down. The path that follows the ridge line is lovely and run-able, with a few hairpins and sharp turns, treating us to heat pockets of sunshine and some scrambling too. When you reach the end of the path overlooking the Parador below, you make a sharp left turn to descend down into the valley and the trail becomes busier with hikers walking in single file in both directions. 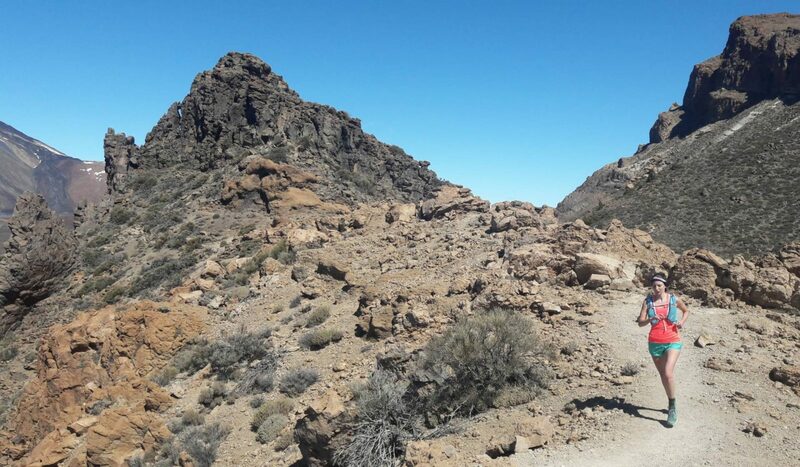 After refreshments at the Parador cafe, a busy hub of tourists and cyclists, we walked across the valley floor to admire the incredible Roques de Garcia – spectacular remnants of volcanic erosion and emblematic of the island of Tenerife. You could spend hours gazing at these fascinating rock formations, bright red in colour and jenga-like in their crooked but natural structure. 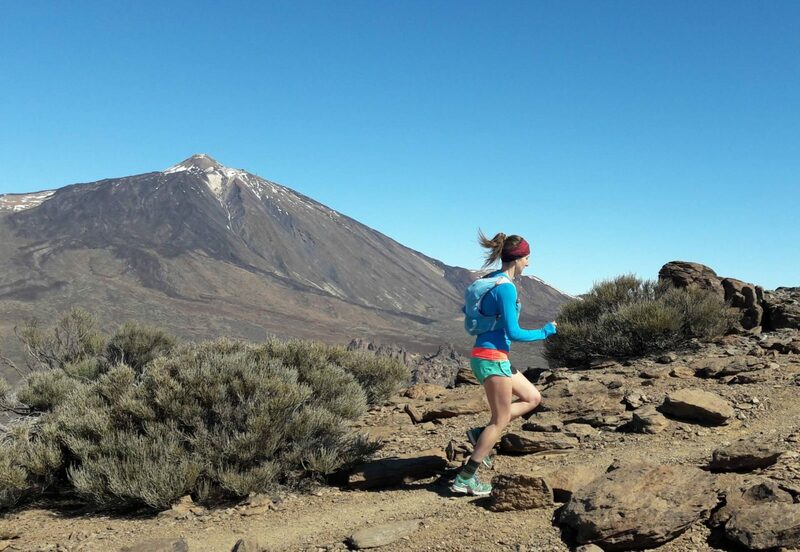 When, and not if, we return to this beautiful island, we hope the weather will be kinder to allow us to reach the summit of the incredible Mount Teide – it was not on our side this time, with the mountain refuge inaccessible due to the closed trails surrounding it – but it just gives us another reason to come back and explore! and see the sunrise we hoped to from Tenerife’s highest peak in its beautiful National Park.